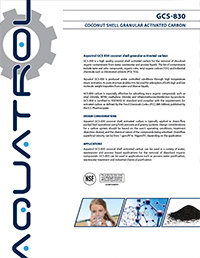 Aquatrol MED-GCS Series Coconut Shell Activated Carbon can be used in a variety of water, wastewater and process liquid applications for the removal of dissolved organic compounds. MED-GCS Series can be used in applications such as process water purification, wastewater treatment and industrial chemical purification. 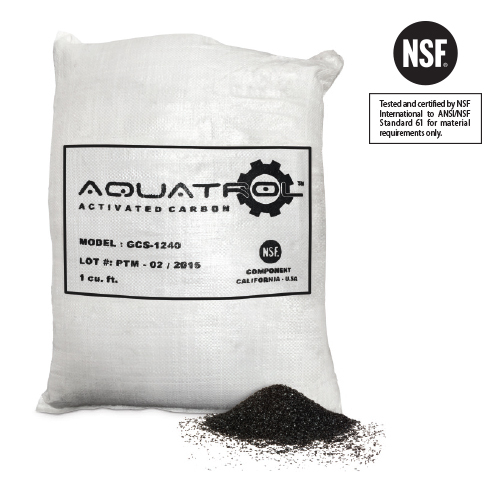 is a high quality coconut shell activated carbon for the removal of dissolved organic contaminants from water, wastewater and process liquids. The list of contaminants include taste and odor compounds, organic color, total organic carbon (TOC) and industrial chemicals such as chlorinated solvents (PCE, TCE). is produced under controlled conditions through high temperature steam activation. Its pore structure enables it to be used for adsorption of both high and low molecule weight impurities from water and diverse liquids. is especially effective for adsorbing trace organic compounds such as vinyl chloride, MTBE, methylene chloride and trihalomethanes/disinfection by-products. 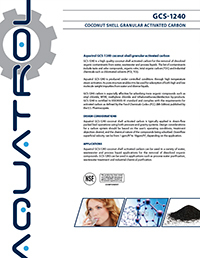 GCS-1240 is certified to NSF/ANSI 61 standard and complies with the requirements for activated carbon as defined by the Food Chemicals Codex (FCC) (8th Edition) published by the U.S. Pharmacopeia.